Hazardous Material Storage: What Should I Consider? Hazardous material storage is a crucial (and sometimes tricky) process. If you’re inexperienced with hazardous material storage, there are many factors that you might not have considered. When storing your hazardous material, U.S. Chemical Storage is here to help. Firstly, understand the characteristics and hazards of the material you intend to store. Knowing if your hazardous material is flammable, combustible, corrosive, or reactive can help you determine what storage options are available. This information should be printed on the material’s label, but looking up your supplier’s MSDS (Material Safety Data Sheet) online can be more informative, and even list pertinent storage information. Storage information will take into account the material’s melting point, boiling point, and flash point, all of which are critical to maintain your hazardous material storage. You should also understand what other substances your hazardous material is incompatible with, such as flammables, oxidizers, or more specific chemicals that may react with your material. Knowing this will enable you to prevent dangerous chemical reactions by segregating your hazardous material. Secondly, determine what amount of the hazardous material you intend to store. Some hazardous materials, such as fertilizers or pesticides, should only be stored according to the season. Storing as little of a hazardous material as possible can help to mitigate hazards. Often, however, large quantities of hazardous material storage are unavoidable, even economical. Planning ahead will help you to select a structure large enough to house all of your hazardous material storage. Once you know these things, it comes down to designing your hazardous material storage building. With the proper specifications and accessories, your building should maintain your hazardous material storage with safety and compliance. U.S. Chemical Storage’s full line of accessories is there to help you furnish your hazardous material storage building with systems to enhance safety within your facility. Mechanical ventilation, fire suppression systems, and explosion-relief construction are just a few options available to safeguard your personnel. Additionally, a containment sump will prevent leaks or spills from escaping your building until you are able to properly clean and dispose of it. 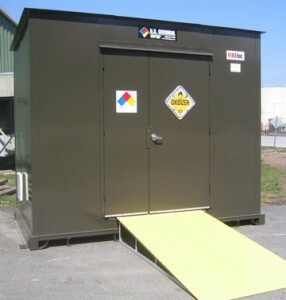 Don’t settle for anything less than a custom-built hazardous material storage building for your storage needs. At U.S. Chemical Storage, we understand hazardous material storage. With our fully compliant structures, we always bring you the highest safety standards for your protection.